Dr. Greg Millar, DC CCEP is a Huntsville Alabama Chiropractor and Founder & CEO of Millar Chiropractic Clinics, Alabama Laser Spine, Neuropathy Laser Center, and Millar Chiropractic Functional Medicine. In addition to being a Doctor of Chiropractic, he holds the CCEP designation and is Certified in the treatment of extremities (hips, knees, ankles, feet - shoulders, elbows, wrist, hands). He has been practicing since 1997. Dr. Millar practiced for years with the neurosurgeons of UAB Dept of Neurosurgery handling their cases before and after surgery. He has treated thousands of disc and sciatica patients over the years with decompression traction, lasers and conservative care. Dr. Millar is perhaps best known for his appearances on ABC WAAY TV Channel 31 over the years. He was the host of MedLine TV Show Saturday night for 12 years. He has authored four books "Avoid Back Surgery at All Cost," "Treating Neuropathy- This Might Just Be The Answer," "The Boost Your Metabolism Diet," and DREAM Wellbeing - Diet Rest Exercise Activity and Mental State." He is a local speaker for civic, business and church events but most of all he is a Doctor and enjoys treating patients. This is a powerful testimonial about a woman who was a dental assistant for 33 years and suffered from debilitating pain, as a result. Multiple doctors turned her away and told her there was no hope. She had tried a Chiropractor before and nothing worked. One day, while watching Dr. Greg Millar, on TV, she decided to give it, one more try. Here is the powerful story of what happened for a woman who had the courage to try one more time.."
Dr Millar founded Millar Chiropractic Clinics in 1998. 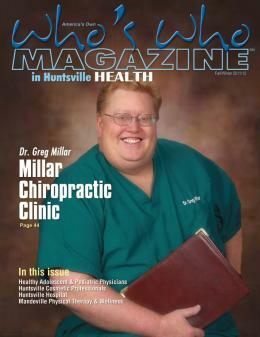 Today Millar Chiropractic Clinics is the largest privately held group of Chiropractic Clinics in Alabama. He serves as the CEO and spokesperson for Millar Chiropractic Associates, Inc., Millar Chiropractic, and Millar Chiropractic Clinics. Dr. Millar gladly offers Millar Chiropractic patients a Free* NO Obligation consultation/meeting with him and any of the Millar Chiropractic Doctors to go over your case, films and recommendations for care. Just ask your Millar Doctor to set it up for you. Dr. Millar in 2014 founded the Neuropathy Laser Center Huntsville for treatment of peripheral neuropathy and nerve pain disorders after himself getting neuropathy. Dr Millar says, "I looked everywhere for a treatment that works. I found my answer with the LN Protocol using robotic lasers and neurostimulators. I was so impressed that I trained in the technique and brought it to Huntsville." He practices two days per week at the Neuropathy Laser Center along with the other doctors. Neuropathy is nerve damage. This is often a progressive disorder and the longer you wait to get treatment the more nerve damage. At the Neuropathy Laser Center Huntsville Dr. Millar treats Neuropathy, Peripheral Neuropathy, Diabetic Neuropathy and Chemo Induced Peripheral Neuropathy. You can contact him there at (256) 539-0077. The Neuropathy Laser Center utilizes the LN protocol for treating Neuropathy. The Neuropathy Laser Center Huntsville is the only neuropathy treatment center in Huntsville and the Tennessee Valley licensed to use the LN Protocol. This protocol is the same treatment used by Mayo Clinic, Johns Hopkins, Harvard Medical, UCLA Medical, MD Anderson, Sloan Kettering Memorial, Cancer Treatment Centers of America to treat their neuropathy cases. In 2015 Dr. Millar embarked on a new pathway, Functional Medicine. After 22+ years in practice and successfully treating thousands of patients with physical problems, Dr Millar wanted to do more for his patients with chronic diseases like Fibromyalgia, IBS, Anxiety, Hormone problems, Thyroid disorders and Diabetes to name a few. He saw the failure of traditional medicine in treating these chronic disorders. "The combination of Big Medicine and Big Phama just left so many patients on the sidelines in pain without a true diagnosis or treatment" stated Dr. Millar. So Dr. Millar went back to school at Kingdom College of Natural Health and the Functional Medicine University and started taking classes in Functional Medicine & Integrative Medicine. Along the way he slowly started treating some functional medicine patients. Somehow the word got out and the patients are coming in droves to see Dr. Millar for functional medicine. Currently he practices functional medicine one day per week. Dr Millar said, "I hope to finish my Naturopathic Doctor's degree in 2019. I will then sit for the NMD exam. Dr. Millar is also a medical inventor having invented the "Millar Facet & Stenosis Table" with the "Millar Facet & Stenosis Protocol" to treat Facet and Stenosis pain from Degenerative Facet Disease, Facet Arthropathy, Facet Syndrome and Stenosis Pain from Stenosis. All of the Millar Chiropractic Clinic have these tables. So if you need to lean over the "buggy" when you go shopping or if you are always looking for a bench to sit down for "just a minute till your back can stop hurting" then you need the Millar Facet & Stenosis Protocol and the Millar Facet & Stenosis Table. Just ask your Millar Chiropractic Doctor. He is married to the former Tracy Lynn Crawford. They have three children and three grandchildren. He is active in the Baptist Church and several christian organizations. Board Certified Part III: Includes questions that address nine clinical areas: case history, physical examination, roentgenologic examination, clinical laboratory and special studies examination, diagnosis or clinical impressions, chiropractic techniques, supportive techniques, and case management. National Board of Chiropractic Examiners, Atlanta, GA 1997. University of Western States College of Chiropractic - Post Graduate Training: Study towards CCIM Certified Chiropractor of Integrative Medicine. Personal History: Dr Millar was born and raised in Cullman Alabama. There he attended elementary and middle school. In the 8th grade, he won the Alabama State Science Fair and a scholarship to Woodward Academy. During, Dr Millar's last two years at Woodward Academy, he was dual enrolled at Ga Institute of Technology (Ga Tech) in the Electrical Engineering program. He graduated from Elkins Institute at Georgia Tech. After receiving his FCC 1st Class Radio/TV Engineers' license, he joined the family business as Chief Engineer over 5 radio stations and 1 TV station. He continued his education and finished his Bachelors of Science at Barry University in Miami, Florida. After a construction accident, Dr Millar had back surgery. That event changed his life. A year later he had a second back surgery. A year after that he had back surgery #3. He stated that "he was in constant pain 24 hours a day every day." His brother suggested Chiropractic; but, Dr. Millar remembers saying, "I need a real Doctor, not a Chiropractor. I've had back surgery and NO Chiropractor is going to crack my back." Dr Millar expressed that 35 years ago Chiropractors weren't accepted like today. He further stated "At the time, he was scared of Chiropractors. He really didn't personally know what they did or didn't do. He was just scared of the unknown." He went on to say, "they were talking about another surgery at the time and my surgeon said "No Way" to Chiropractic." Dr Millar stated, "I got to the point that I had no other options. I had tried everything else and was still in terrible pain. Medicine had failed me. I had nothing else to loose, so I tried Chiropractic." "Within eight weeks my pain had dropped 50%. I was able to start getting off some of the pain meds. I had been in complete diabiliting pain every day for three years and what finally got me out of pain was Chiropractic." For this reason, Dr Millar shared that he became passionate about sharing Chiropractic with others. "I told my family that I was going to Chiropractic School," they laughed. They told me I was nearly 40 and too old. He moved to Atlanta and started over again in college taking courses at two colleges to get the additional science courses he needed to get into Chiropractic school. He then attended Life University, College of Chiropractic where he was President of his Class, and President of the Student Body and Graduated with Honors. In post graduate training he studied extremity adjusting (hips, knees, ankles, feet, shoulders, elbows, wrist. hands, TMJ and ribs) and earned his Certified Chiropractic Extremity Practitioner, CCEP designation. He has passed all four parts of the National Board of Chiropractic Examiners as well as the Alabama State Board of Chiropractic Examination. He has completed additional post graduate study in Functional Medicine, Neurology, Neuropathy, Orthopedics, Physiological Therapeutics, Auto Accidents, Trauma, and Non Surgical Disc Treatments (Decompression Traction) for Bulging and Herniated Disc problems. For several years, as a professor, Dr Millar taught Anatomy and Physiology at several local colleges (Wallace State & Calhoun College). Dr. Millar in 2001 was approached by WAAY TV Channel 31 the ABC affiliate in Huntsville about developing a 30 minute live medical call in talk show. The Show "MedLine" was born in 2002 with medical doctors and chiropractors openly discussing their similarities and differences in treating various conditions. The show quickly gained a loyal following and was one of the top medical talk shows in Alabama with thousands watching each week. Many local area internist, orthopedist, neurologist, cardiologist, radiologist, and many others have joined Dr Millar on the show. In 2003 Dr. Millar opened Millar Multi-Medical. Together with UAB they opened the UAB North Outreach Clinic. Dr. Millar worked closely with UAB Dept of Neurosurgery and Dr Mark Hadley, MD helping to develop the UAB Dept of Neurosurgery Chiropractic Care Team. The idea was to further train Chiropractors to integrate with Medical Doctors and specifically Neurosurgeons to provide conservative care to patients before surgery and rehabilitative care post surgery. The program was a great success. For 9 years, the Neurosurgeons from UAB Dept of Neurosurgery rotated weekly to practice at the UAB North Outreach Clinic along with Dr Millar and his team of Chiropractors. With the purchase of Parkway Hospital and Decatur General Hospital by Huntsville Hospital in 2012, UAB closed the North Outreach Clinic and pulled all neurosurgery services back to the "mothership" in Birmingham to serve its primary patient base. As a Huntsville Alabama Chiropractor and a Madison Alabama Chiropractor , he enjoys diagnosing and developing treatment plans for Low Back Pain, Neck Pain, and difficult cases, before or after surgery, like herniated, bulging and prolapsed disc cases with and without radicular pain. He enjoys helping patients find non surgical solutions for disc problems, Stenosis and Degenerative Disc Disease and Degenerative Facet Disease cases. He has pioneered multi-disciplined approaches utilizing Chiropractors, Physical Therapist, Physiatrist, MD's and DO's working under one roof. He also enjoys helping neuropathy and chronic pain patients and more. You can always e-mail Dr Millar at [email protected] for patient questions or [email protected] for business e-mails. Laser Pain Center Huntsville, LLC. d/b/a Neuropathy Laser Center Huntsville and Advanced Health Management, LLC., d/b/a Alabama Laser Spine Decompression are a separate and independently owned and managed companies from Millar Chiropractic Associates, Inc., Millar Chiropractic and Millar Chiropractic Clinics and their individual clinic corporations. Each Millar Chiropractic clinic is individually owned and operated. Dr Millar is the Managing Member and Chief Clinic Officer of Laser Pain Center Huntsville, LLC., and Advanced Health Management, LLC. Results vary case to case. Free/No Cost Consultation is meeting to discuss your problems and our solutions. Additional fees or cost may be charged in individual cases for additional treatment or visits should you become a patient. Some persons are not allowed to receive free services. If that is your case then Free offers do not apply to you. No representation is made by Dr Greg Millar or Content therein or otherwise that the quality of services to be preformed is greater then the quality of services performed by other Doctors, Lasers, or treatments.